Pennsylvania's congressional districts are considered among the most gerrymandered in the United States. 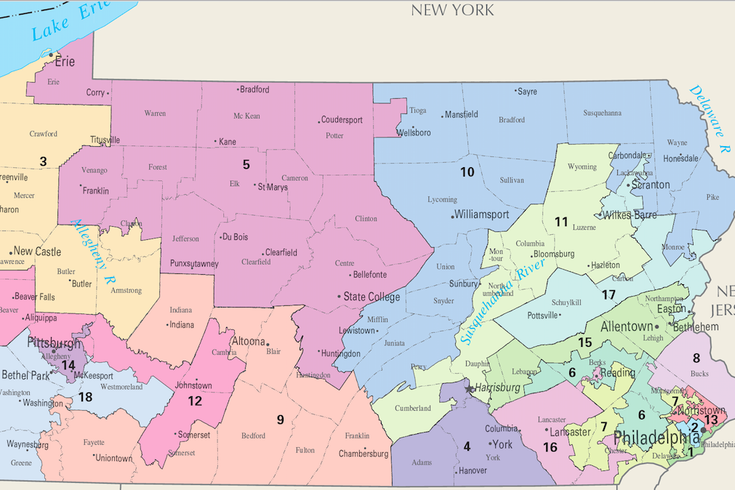 The Pennsylvania Supreme Court declared on Monday that the state's 18 congressional districts are unconstitutionally gerrymandered, a ruling that could heavily impact the 2018 midterm elections. The Democratic-controlled court ruled that the district lines – mapped out by Republicans in 2011 – "clearly, plainly and palpably" violate the state constitution. In a 5-2 decision that split down party lines, the court said lines must be redrawn in time for the May 15 primary. A new plan will be available by Feb. 19. But the body – or party – that draws up those lines hinges on a number of deadlines. The court gave the General Assembly – which remains under Republican control – until Feb. 9 to submit redrawn lines to Gov. Tom Wolf – a Democrat – who must approve the plan no later than Feb. 15. If either the legislature or Wolf fails to approve new lines, the Supreme Court said it would undertake the redistricting plan on its own, using the evidentiary record developed in Commonwealth Court. In anticipation of that outcome, the court will accept remedial districting plans from all parties until Feb. 15. The special election in the 18th Congressional District remains unaffected by the decision. The decision stems from a legal challenge brought by a group of 18 Democratic voters and the Pennsylvania League of Women Voters. But Republican lawmakers have defended the maps as constitutional. Drew Crompton, counsel to Senate President Pro Tempore Joe Scarnati, told PennLive that Republican leaders plan to seek a stay of the order from the U.S. Supreme Court. Pennsylvania's congressional districts rank among the most gerrymandered in the country, according to the Brennan Center for Justice. The Seventh Congressional District, which snakes through five counties, is considered particularly egregious. The current districts pack large concentrations of Democratic voters into districts where Democrats have far more voters than needed to win. The remaining Democrats are spread across several districts that are more competitive, but still hand Republicans a decisive edge. The result? Republicans hold 13 of the state's 18 congressional districts despite Democratic voters outnumbering Republican voters by a 5-to-4 margin. Democrats owned a 12-7 advantage as late as 2010 – when the state had 19 congressional districts. But the midterm elections that year handed Republicans a 12-7 advantage. And the GOP-controlled General Assembly redrew the congressional lines in a way that makes it more difficult for Democrats to win. That process – dubbed partisan gerrymandering – has been challenged in various states. The U.S. Supreme Court will rule on a similar case from Wisconsin, Gill vs. Whitford, later this year. Due to the impending decision in that case, Pennsylvania Supreme Court Chief Justice Thomas G. Saylor dissented from the majority, arguing it would have been prudent to withhold judgment until Gill vs. Whitford is decided. Justice Sallie Updyke Mundy also dissented, saying the court order fails to identify a specific provision that the current district lines violate. She also expressed concern about striking down the congressional lines on the eve of the midterm elections and questioned the legality of the court's plans to draw up its own maps. Justice Max Baer wrote a concurring opinion, concluding that the congressional districts are unconstitutional. But he saw dangers in implementing a new map before the primary election. Prospective challengers and incumbents have been organinzing and fundraising for months. "It is naive to think that disruption will not occur," Baer wrote. "The change of the districts' boundary lines at this time could result in candidates ... no longer living in the districts where they have been carrying out these activities for a year or more."